The A-Town Girls book club from Colorado received the honor of participating in the first official author/book club video chat session via Novel Network! 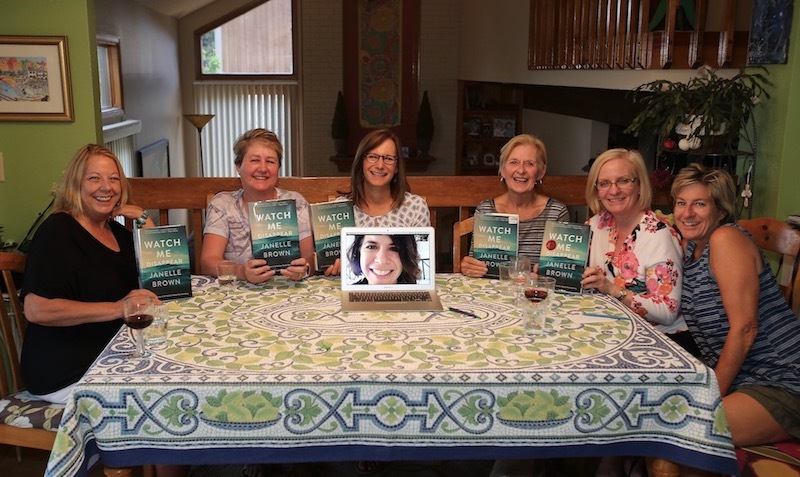 On May 17, 2018, our book club connected via FaceTime with author Janelle Brown to discuss her New York Times bestselling novel, Watch Me Disappear. Unanimous consensus – this book is a must read! Prior to our scheduled chat, we shared a meal and a glass of wine together and discussed the book in general terms. This helped us to flush out some of our questions for the author so we could make the most of our 30 minute chat session. As this was our first experience with this service, we didn’t know quite what to expect, and we wanted to be prepared and respectful of the time allotted. As it turned out, we need not have done so much planning, as the conversation flowed and before we knew it, our 30 minute session came to a close. Our video chat was a huge success, Ms. Brown was charming and engaging, and we ended (too quickly) with rave reviews! If you haven’t scheduled your author visit yet, what are you waiting for?! You absolutely will NOT regret it!